0:07Skip to 0 minutes and 7 secondsThe Lancet Series On Midwifery is a series of four papers looking, using a different range of research methods, at the strong evidence now that we know that underpins the importance of midwifery. For mothers, for babies, for families, for communities in low and middle and high income countries across the world. We've looked at the impact it will have. We've looked at how it can save lives and help improve health and well-being. And we've looked at how to implement that in a health system. And so it can be used now by decision makers, whether those are policy makers, ministers of finance and health. Or whether those are health professionals themselves. 0:44Skip to 0 minutes and 44 secondsOr indeed women themselves, in helping to develop health systems that will be effective and efficient, and good for women and babies. Every now and then, something very special comes along. And this is an extremely special series. It's challenging, it's creative, and it's constructive. This morning was very interesting. Particularly interesting was the framework for midwifery services. Because it not only describes the different components of the services that are needed, but gives an idea of who can provide those different elements of the midwifery services. And the importance of the midwife within that context. When it comes to putting a programme together and convincing government, and harnessing political will, first question they always ask is where's the evidence? 1:36Skip to 1 minute and 36 secondsAnd so even though we all had pockets of excellence and we knew the solutions, The Lancet Series is now harmonising all that evidence for us, and making sense of it, and extrapolating it. So we at WHO think this Lancet Series in Midwifery will make a significant difference, because it really focuses the attention on the quality of rights based care from the perspective of women and newborns. And for the first time in decades, it provides the evidence that we need for a quality of care maternal newborn health framework. That will enable donors and others to invest in strengthening the quality of midwifery services provided. The job of the first paper in the series was really to set the scene. 2:18Skip to 2 minutes and 18 secondsIt was to start the analysis of existing evidence of what midwifery is. 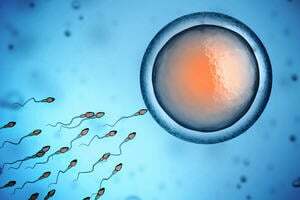 Of how to describe it and really to look at why it matters to women and to babies. And so we had to start by actually defining midwifery. Which might sound strange, but because midwifery varies right across the world. Some countries it's provided by midwives. Some countries it's provided by a mix of nurses, and doctors, and community health workers. And so we actually had to describe midwifery as women and babies need it. And that was the very first step. So we did that. And then we went on to look at what components of care women and babies need. 3:00Skip to 3 minutes and 0 secondsThe whole focus of paper one was to look from the perspective of women and babies. Any mother, any baby across the world. What do they need. And we used a lot of existing evidence. Hundreds of existing reviews and studies of women's views to characterise what would make a difference to women. And we established a framework. Now this framework is becoming, if you like, a stable basis for analysis, but it's also becoming a stable framework for how you might design a health system. Or how you might educate students. Or how you might monitor and assess how a health system is working. And it's got a number of elements to it. So if I just take a few minutes to describe it. 3:46Skip to 3 minutes and 46 secondsThe first top element of the framework, if you like, is to stress that all women and infants need certain kinds of care. And then this additional care that women with complications need. So that's not a low risk, high risk split. That is that all women need certain kinds of care and others need an additional set of care. Moving down the framework, the first line is about practise categories or interventions. What specific things, tasks, do women need from the health system. All women need three different sets of things. They need education, information, and health promotion. The need assessment, screening, and care planning. And they need first line care. The care that will keep them normal, but will prevent complications happening. 4:36Skip to 4 minutes and 36 secondsSo everybody needs that. Then women with complications need possibly two other things. One is first line management of those complications. Again, to try and prevent them from getting worse. 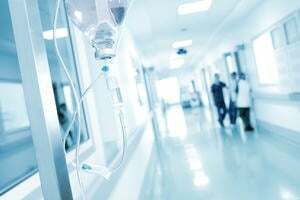 And then finally, they'll need specialist medical care if they have an emergency or a serious medical obstetric, or indeed neonatal problem, if the baby is very sick. The rest of the framework takes through the way in which that should happen. So not just what should happen, but how it should happen and who should provide it. 5:07Skip to 5 minutes and 7 secondsSo the how it should happen, in terms of organisation of care for example, is that continuity really matters between where the women and baby are, where the family is, and the facilities or hospitals that they might be using. So the community through to the facility. And also that those services are accessible and acceptable to the local community. There is then, if you like, the values set in which that care is given, so it's respectful. So it's tailored to women, and babies, and families needs individually. There's then the philosophy of care and really importantly, that's about really helping women to optimise their own strengths. So trying to promote normal process is not interfering too soon, not interfering at all. 5:49Skip to 5 minutes and 49 secondsIf in fact, the mother can manage to give birth herself, to breastfeed herself, without additional extra help. To strengthen women's own capabilities. And then the final element of the framework is the characteristics of the care providers. Obviously they need to be competent and skilled, but they also need a good skill mix integrated with other care providers across different professions. And they need to provide culturally sensitive care. So they're not just doing a one size fits all. So that's the framework. And that framework is being taken by all the other papers to really help them analyse and understand other elements of care. What we then did was we used that framework for analysis. 6:32Skip to 6 minutes and 32 secondsAnd we took out of the literature, an understanding of all of the outcomes that midwifery would then improve. And we found an amazing 56 outcomes in the existing literature. And we've measured those and we've laid them all out. And they include saving lives, saving mothers, and babies lives. Preventing stillbirths through a number of clinical outcomes, but also looking at maternal infant attachment. At psychological outcomes, social outcomes, and indeed at saving costs. And reducing health service involvement. So it's very, very broad and very important that those outcomes can be improved. And finally in the paper, we really looked at the literature around care by midwives and care by other people. And what we found was really important. 7:19Skip to 7 minutes and 19 secondsThat midwives practise the whole scope of midwifery, not surprisingly. And the other less skilled workers can do components of it, but that it's likely to be more fragmented and not so comprehensive, and not so effective. Midwifery is a vital solution to the challenges of providing high-quality maternal and newborn care for all women and newborn infants, in all countries. …A focus on facility-based and emergency care can result in a reduction in maternal and perinatal mortality. However, without the balancing effect of the full spectrum of midwifery care, this strategy has also resulted in rapidly-growing rates of unnecessary and expensive interventions, such as caesarean sections, and inequalities in the provision of care and outcomes. The diagram below outlines the Lancet framework for quality maternal and newborn care: that is, components of a health system needed by childbearing women and newborn infants. You can see how there are components of maternity care that all women and infants need, and some additional things that only certain women or babies require. You can download both the diagram and a text version below in the Downloads section. 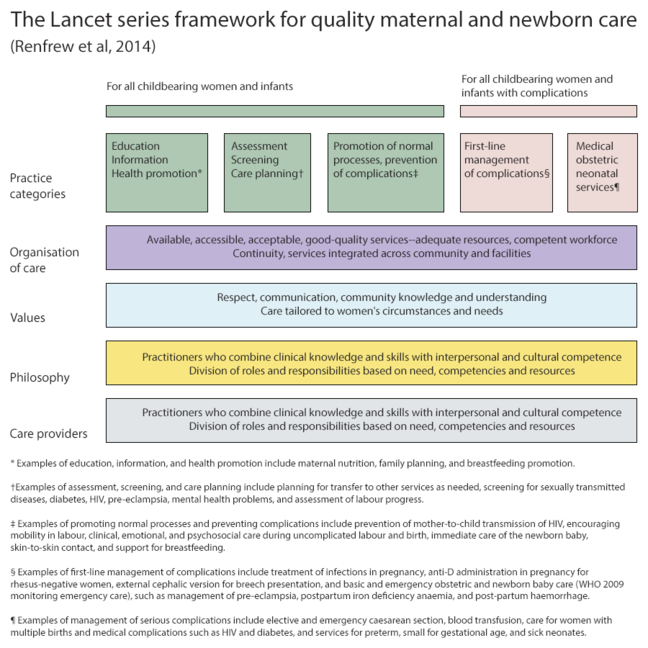 The Executive Summary of the Lancet Series on Midwifery gives more detail on how and why the Lancet framework was developed. Have a look and share your thoughts. Was there anything in the summary that surprised you? What new things did you learn? Renfrew, M. J., Homer, C. S. E., Downe, S., McFadden, A., Muir, N., Prentice, T., ten Hoope-Bender, P. (2014) Midwifery: An Executive Summary for The Lancet’s Series, The Lancet, June 2014.